We’ve been playing with our Big Green Egg pretty hard. Many of the results have landed on this blog. But, with all that bar-b-que, we had never done any ribs! I know! What the frack were we thinking? 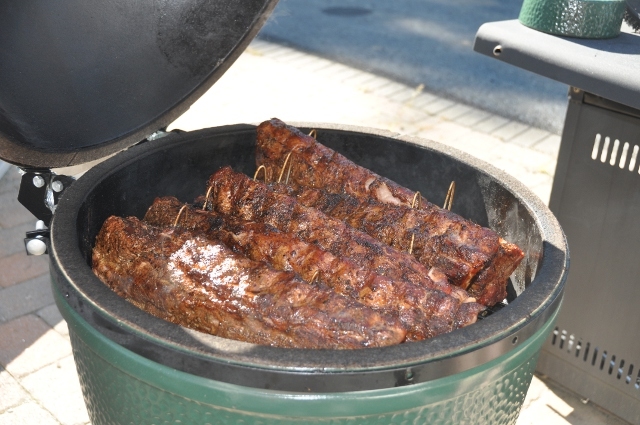 Well, it just so happened that we needed to do another Big Green Egg event at work… and a solid food blog I follow (Griffin’s Grub) had literally just posted a whole thing on baby back ribs. The cards had been played, I could not deny it any longer! So what’s all this about a “meat and three” then? The ribs on the Egg, with my home-made spacers. The phrase “meat and three” was unknown to me, until I traveled to our corporate office in Nashville. It is simple: choose a meat, choose three sides, order a sweet tea (iced tea with plenty of sugar, maybe some lemon), and enjoy. The beauty of it is that when a place offers three or four good meats (generally a brisket, ribs, sausage, and chicken) and five or six awesome sides (typically mac & cheese, bbq beans, fried okra, fried string beans, corn bread, etc. ), then the possible combinations are just fantastic! (6 * 5 * 4) / (3 * 2 * 1) = 20 different combinations. (8 * 7 * 6) / (3 * 2 * 1) = 56 different combinations of sides! 4 * 56 = 224 different meals possible! Statistics are pretty cool… but, back to the story at hand. Having purchased 15 pounds of quality baby back ribs, and having done my research, I knew I would need some way of keeping them “on end” in the smoker – there is just not enough room to have them all lay flat. I didn’t have time for a lot of engineering, so the morning of the cook, I just grabbed some fence wire (we have horses, and an electric fence that’s about 1/3 mile in perimeter) and a pair of needle nose pliers. I figured I’d just fashion something once I got there and could “touch and feel” a solution. A little Geary’s Autumn Ale and some butter to tenderize! The night before, I had prepped the ribs. Rubbed with brown mustard, then with a combination of Jamaican jerk seasoning and Stubbs BBQ rub (equal amounts of each), then wrapped in plastic and set in the fridge. Now, it was 5am, and I was at the office, taking out the ribs to get closer to room temperature, and setting up my plan. I cut up a bunch of wire, and bent them into little triangles with loops on the ends to catch the grill. I had the grill off the Egg, on a table, to do the work. It seemed pretty solid, so I added the ribs, and set it aside. Once the Egg was up to temperature (250F), I dropped in a foil packet of mesquite chips, set the heat diffuser in place (a big aluminum pan that also acts as a drip pan), and lowered the entire grill/hanger/rib assembly into place! Buttoned it up and started the waiting game. Per recommendation, I let them smoke for 2.5 hours. Then, I pulled the entire grill/hanger/rib assembly out of the Egg, and began Phase 2… tenderizing. 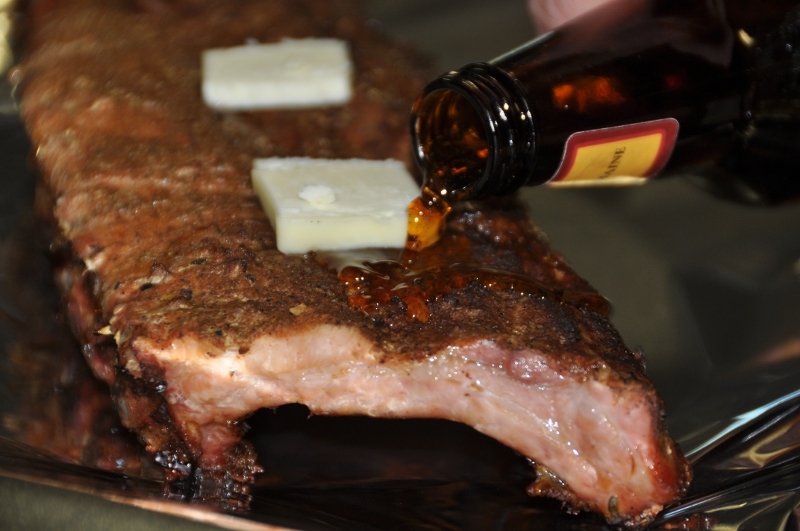 This involved putting three thin pats of butter on each rib rack, setting it on foil, and pouring on a little beer (Geary’s Autumn Ale, brewed in Portland, Maine), then wrapping it up in more foil. Back on the Egg for another 45 minutes, still at 250F. Finally, Phase 3… crisping. Pulled everything out again, removed all the foil, and set the ribs on the Egg one last time, with a handful of fresh mesquite chips on the coals, for a final smoke. I let it go another 1.5 hours, but I don’t think it was quite enough. The meat was “done” but the surface didn’t crackle… Next time, I will do a high temperature “finish” in the final hour… let the Egg get up to 500F, then close it up completely and let it slowly cool. That technique worked really well with some pulled pork, and it may give me the effect I was missing. After letting the ribs rest for a half hour, we cut them into two-rib segments and started the feast! Well, that’s the “meat” portion… what about the “three”? Fortunately, my co-workers rescued me. 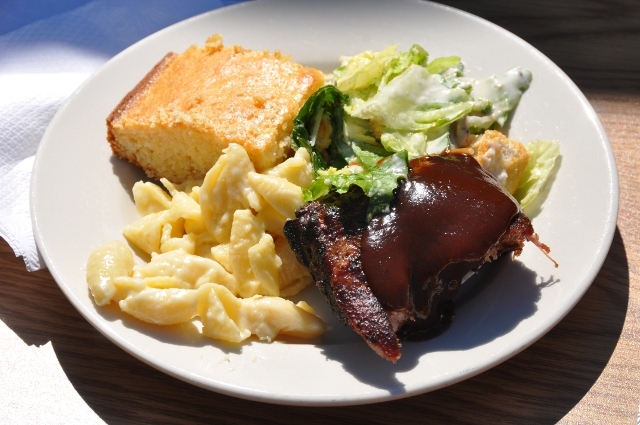 We had mac & cheese, cornbread, and Caesar salad ready to go by lunchtime, and a bonus of a chocolate zucchini cake! All in all, it made a wicked yummy lunch. A plate of “meat and three” with sauce.